Are you coming to arrest me? For twenty years at 1:10 A.M.
in the winter sun Too lazy to get ahead, you! From Tang Dynasty era China, another sequence of poems about loss. From Mexico, another poetic response to national calamity. During China's Cultural Revolution, a government campaign to rid China of "counterrevolutionary" influences, millions of innocent people were persecuted: forced to leave their homes, fired from their jobs, imprisoned, tortured, and murdered. This poem depicts events from that time. In written Chinese, symbols that represent words or sounds. Originally appeared in Words Without Borders, May 2004: Chinese Characters. Yu Jian (于坚) was born in 1954 in the southwestern Chinese province of Yunnan. With the outbreak of the Cultural Revolution in 1966, his schooling was interrupted, and his parents were forced to leave home to undergo “re-education.” At the age of sixteen, he became an apprentice in a factory north of the city and worked as a riveter and welder. Influenced by his father’s interest in classical Chinese poetry and aided by frequent power failures at the factory, Yu Jian became a voracious reader and he began writing his first poems in free verse. In 1980, when university education once again became a possibility, he became a student in the department of Chinese Language and Literature Yunnan University. In 1986, Shikan, China’s most prestigious official poetry magazine, published his poem “No. 6 Shangyi Street.” He later published the controversial long poem File Zero (1994), as well as Notes from the Human World (1999), a collection of travel sketches and impressions of daily life.. His five-volume collection of selected poetry and prose, The Yu Jian Collection, was published in 2004. He has written three plays, In Connection with AIDS, About an Evening Conversation, and About a Discussion on the Far Shore of the Nature of Chinese Words. Wang Ping was born in Shanghai and grew up on a small island in the East China Sea. After three years of farming in a mountain village, she attended Beijing University. In 1985 she left China to study in the US, earning her PhD from New York University. Her works include the short story collections American Visa (1994) and The Last Communist Virgin (2007); the novel Foreign Devil (1996); the poetry collections Of Flesh & Spirit (1998), The Magic Whip (2003), and Ten Thousand Waves: Poems by Wang Ping (2014); the cultural study Aching for Beauty: Footbinding in China (2000); and the traditional Chinese folk tale Emperor Dragon (2006). Ping edited and co-translated the anthology New Generation: Poetry from China Today (1999), and her writing has appeared in numerous journals and anthologies. She has received awards from the National Endowment for the Arts, the New York Foundation for the Arts, the New York State Council for the Arts, and the Minnesota State Arts Board. She is a professor of English at Macalester College. Look through long-hidden photos in "A Panoramic View of China's Cultural Revolution." View a gallery of propaganda posters from the Cultural Revolution era. Read Encyclopedia Britannica's entry on the Cultural Revolution. Watch a trailer for the film To Live, which depicts one family's journey through modern Chinese history. Find out why Yu Jian says, “If it wasn’t for the Cultural Revolution, I probably wouldn’t have written poetry” in this interview with Full Tilt. Read more poetry from Yu Jian, published in Words Without Borders. Listen to songs from the Cultural Revolution era, or watch clips of propaganda films. Also, listen to an interview with the filmmaker of Morning Sun about her own experience in the Cultural Revolution. View Sheng Qi's contemporary photograph Memories (Mao) below, or on the website for the International Center of Photography, where you'll also see Memories (Mother) and Memories (Me). 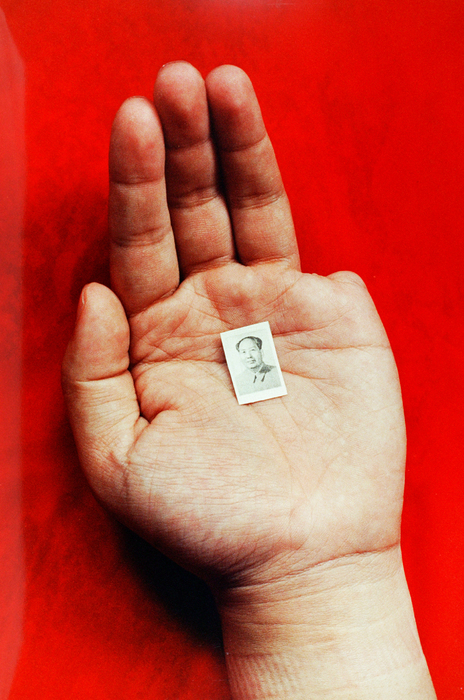 The photograph depicts an open hand holding a small black-and-white photograph of Mao. The hand is missing a pinkie finger. Look at propaganda posters from the Cultural Revolution era: this 1967 poster, the poster "We smash his dog head who dares to oppose Chairman Mao", and Dazibao (Big Character Posters) from Shanghai. For teachers: look at this teacher's guide on China's Cultural Revolution to use memoirs about the era to help students better understand the history and politics of the time. Read two essays by Yu Jian on his hometown, Kunming: “Kunming, My Personal Movie” and “Wuhua and Me," which also includes his first published poem. For a comparison with poetry from ancient China, read Du Mu’s "Poems for Parting," which also deals with loss. Also, read the Russian poem The Bronze Horseman by Alexander Pushkin, which has some connections with Stanza 6. 2. What are "Things from the Past"?